5th Day of the 5th Moon (according to chinese lunar calendar) is an important date to many cultures. In 2018, the day falls on 18th June. It is the day that coincides to the Summer Solstice. Therefore, it is the longest day with the highest temperature of the year. While some may not have known, this day is a day of great evil. There is hidden fear and horror associated to the day. 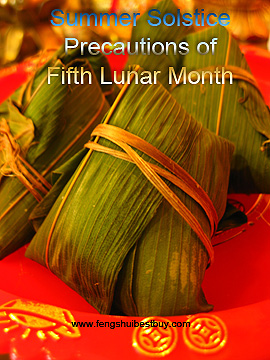 In fact, the whole of 5th lunar month has to be taken cautiously. One should not carry out any important events such as moving into a new home, getting married and starting a new business in the 5th lunar month. The festival celebrated by chinese worldwide is known as the Dragon Boat Festival, Summer Festival, Dumpling Festival or 5th Month Festival. It is said to be related to the dragon and celebrated in hope for the dragon to send down sufficient rain for farmers. The dragon is chartered by the heaven to send rain to mother earth for those who are new to it. Chinese would make glutinous rice dumpling wrapped in reed leaves and offer it to the dragon as a sign of respect. When water is sufficient, there will be big gains from good yields of crop in the following year. Sufficient water will enable avoidance of many diseases due to poor hygiene. 1. Display a Peacock Mirror in the house and display it in the living room. The peacock is known to have supernatural powers to kill off poisonous animals. They are the poisonous toad, spider, scorpion, centipede and snake. These poisonous animals represents evil influences and become wild and uncontrollable during the 5th lunar month. 2. Display at the maindoor's doorknob the peachwood sword to combat evil spirits. It is the weakest time of the year where evil come to revenge on people for their bad karma. 3. Invite the Ghostbuster Chung Kwei to invoke his energies to help human fight evil. 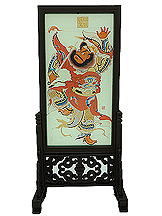 For the safety of family members and kids, it is best for them to carry along the Chung Kwei Amulet. 4. Invoke the powers of "5 Emperors" for general blessings against any harm and danger throughout the 5th month. The "5 Emperors" refers to Fu-Hsi, Shen-Nung, Huang-Ti, Shao-Hao and Chuan-Hsu. They are the five rulers of the entire universe and controls all the four celestial animals and 5 Elements (wood, fire, earth, metal and water). The 5 Emperor Coins Disc Charm (of Ching Dynasty) can be used as a representation to invoke their powers to ward off evil, and especially effective in fighting diseases and viruses. This is a must have to be displayed in the living room of the house for protection. For those who are working in enviroments that spell danger, such as soldiers who needs to go to war, construction workers, engineers at gasoline plants etc, one can wear the powerful Dzi Pi Yao for protection and safety. 1. One must not expose their beds, comforters, pillows, bedsheets and mattresses under the sun during the entire month. 2. One must not climb the roof or he might risk falling to death. 3. Avoid moving into new homes and opening new businesses this month as it is considered inauspicious and bad luck on new ventures. 4. Avoid getting married during this month because couples will have bad ending. Some evil may cast a bad spell on couples during their wedding. 5. Avoid going for jungle trekking and going on camping trips as chances of injuries, possession and death are high. 6. Drive very carefully during this month to avoid accidents. 7. Perform charitable work or contribution during the month.